American Noah Lyles ran the fastest 100m of the year to win the US national title in Des Moines, Iowa. The 20-year-old clocked 9.88 seconds, ahead of Ronnie Baker and Kendal Williams. In the semi-finals, Lyles had equalled Mike Rodgers’ world-leading time of the year of 9.89, set in Thursday’s heats. 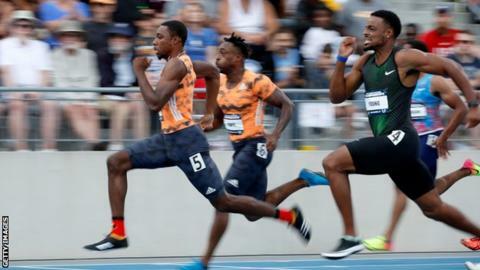 Baker’s 9.90 in the final was the third-quickest time of 2018, while Britain’s Zharnel Hughes, 22, last week ran 9.91. Hughes’ time was the quickest of the year until the USA Track & Field outdoor championships. World indoor record holder Christian Coleman and 100m world champion Justin Gatlin are both missing from the event. Lyles, better known as a 200m specialist, holds the joint-quickest time of the year in that event, running 19.69 last month. Olympic 100m champion Elaine Thompson put an injury-hit start to the season behind her to win the Jamaican championships title. The 25-year-old beat three-time world champion Shelly-Ann Fraser-Pryce into second place, while Olympic 400m bronze medallist Shericka Jackson finished third.